The Land of Misfit Bloggers? I am a toy gun that shoots jelly. A train with square wheels. I guess I am a mommy blogger. Because I am a mommy. And a blogger. But I’m having trouble defining myself… finding my voice… understanding why I feel compelled to do this. I guess I almost fit into a few of these. But not really. Are there other bloggers out there like me? If so, where? …while learning more about myself and the people and world around me. And perhaps I should add – while trying not to drive myself and those around me crazy with my seemingly unattainable goals. 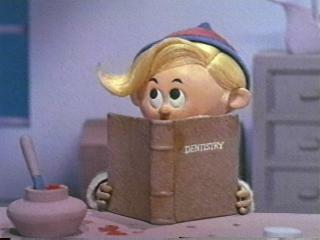 So… am I Herbie, who wants to be a dentist? Or are there other mommy bloggers out there like me? Let me know. And watch out for the Bumble.